For over eight years, Plasq’s Comic Life has provided an easy way to present your photos and other images in comic book form. (We previously reviewed version 1 and version 2 for Mac Gems.) Now at version 3, Comic Life offers more features geared toward people who have a serious interest in storytelling using the comic book medium. 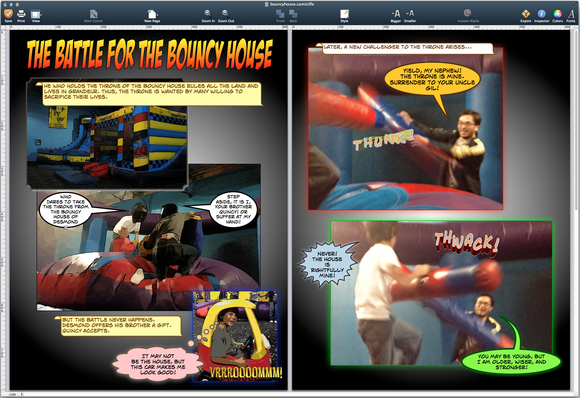 Comic Life 3 now supports two-up page viewing. It’s likely that most folks use Comic Life to throw a few pictures together to create simple, humorous anecdotes, and the app works well for that. But if you want to tell more detailed, complicated stories, Comic Life now has a Script Editor to help you form your comic’s storyline. The Script Editor uses keywords to automatically format the text in the proper way. For example, If you type a person’s name, Comic Life recognizes that you want to format the text as speech and will put it in a speech bubble. When the Script Editor recognizes a keyword (Comic Life has a set of default keywords, but you can also add your own), it creates an icon specific to that keyword that appears in an icon column on the left side of your script. You can then drag and drop the icons into your comic and easily adjust the formatting to your liking. Of course, not everyone will want to use the Script Editor—what makes Comic Life so great is that it makes the process of creating your comic fun, and the Script Editor can make it feel more like work. But in 2012, the overall North American market for newsstand comics and trade paperback sales reached over $700 million, so it is work for a lot of people, and the Script Editor makes Comic Life a better real-world tool for those people. 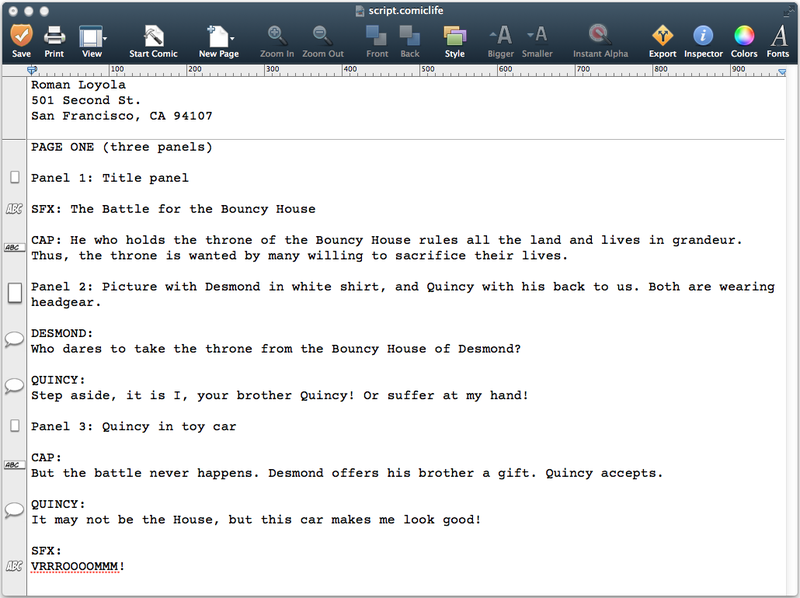 The new Script Editor lets you work on your comic’s script before putting all the elements on a page. One quirk with the Script Editor is that there seems to be no dynamic relationship between the script and the layout, so if you decide to add any kind of text to your comic while in the layout view, those words aren’t automatically added to your script. For example, I decided to add a sound effect to one panel while in layout view; to keep the script consistent with the comic, I had to go into the script and add the sound effect manually. There are also, however, improvements that will appeal to all Comic Life users, especially in the app’s image-editing tools. 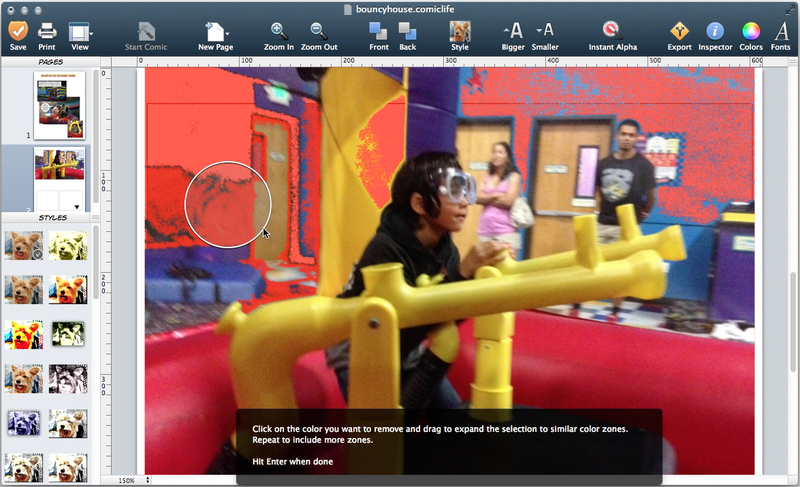 For example, the new Instant Alpha tool promises to erase the background of an image. It works well with monochrome backgrounds, or background where the colors are solids (not gradients), but on photos with busy backgrounds, the tool isn’t so instant—you must do more work to get rid of that background without affecting the primary subject of the image. Comic Life also has new settings for adjusting strokes, fills, and opacity; and new parametric filters to give your images a more artistic look. The Instant Alpha tool can be used to quickly remove a background, though busy backgrounds require more effort. The enhanced speech balloons are my favorite new feature, as unglamorous as they might seem. There’s now a larger variety of balloons, and you get greater control over them. When you click a balloon, a box with control points appears around it—Photoshop users who’ve performed a Free Transform function will recognize this control, and in Comic Life, it works in a similar way. Click a control point, and you can resize the balloon, adjust its tail, and tweak its position. The feature seems mundane, but using the right ballon can help convey emphasis on the text it contains, and adjusting the ballon itself lets you make sure it’s not in the way of your image. Other new features include 3D effects for lettering, the capability to display two pages side by side, guidelines, find and replace across captions and speech balloon, and the capability to create a master page for repeating elements. Comic Life 3 takes a few more steps towards being a complete tool for serious or professional comic creators. Those users will appreciate the app’s ability to export comics as PDFs, images, ePub, or CBZ files. For comic creators with longer, more-elaborate stories to tell, you’ll appreciate the new tools in Comic Life 3, as they can actually enhance your story. If, however, you just like to quickly toss together a few pictures and add some jokes to get a laugh, you’ll probably be happy sticking with your older version of Comic Life. Comic Life 3 is great for comic creators who want better tools to mold their story lines.